Rites of passage, initiations and celebrations serve to concentrate and value growth and changes in our lives; give our journey different meanings; build a vision of the whole. As women we mark the passing of time through transformations on our bodies, with the flow and ebb of bleeding, the shape - shifting of face and womb and breast. We travel on unfamiliar territories of mind and mood. And as we see those who have walked this way before us, so we also watch those that follow on behind. The Women's House exists inside the spirit of our gatherings, a place of the imagination and the heart, as physical as we choose to make it. The Women's House holds the remembered voices of our foremothers, ancient as the land, our common bonds as women and our universal prayers. Within the House, held by the circle or the spiral or the line, we speak alone or within our group voice, we sing and chant and dance and drum. In this, her fourth solo album, Carolyn has sought a route to the core of the experiences and transitions that define our passage through womanhood. 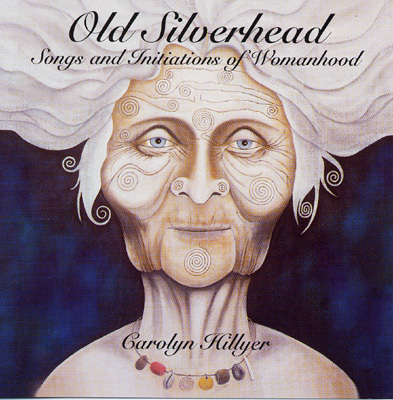 It is a journey of ritual and song, sixteen pieces of music that travel from the tender unveiling of GIRLSEED, through the dangerous lands of MIDWOMAN, towards the culmination of wise knowing and unpredictability of OLD SILVERHEAD herself. Many of the songs and chants are created for singing with others, for threading into group music, for dancing in circles. Carolyn uses her familiar blend of earthly and unearthly in her exploration of woman's shamanic heart. Total album duration 76 minutes.